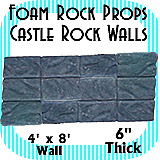 Castle Wall Rocks - Single Rock - Dino Rentos Studios, INC.
Each rock measures 24" by 16" by 6" thick. Great for a medieval or construction theme. As single rocks they can be stacked to create the look you want. Options: get your rock hard coated for a concrete look and feel. 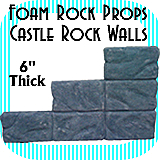 Also makes your rock durable for long-term use and for outdoor use. Price is for one rock. 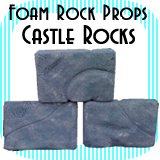 Fake Foam Rock 10" x 10" x 12"
Fake Foam Rock 16" x 18" x 20"
Fake Foam Rocks 18" x 22" x 24"